Frenchboro Harbor and the town of Frenchboro are located on Long Island just southeast of Swans Island in the Atlantic Ocean. Geographically speaking, Frenchboro is eight miles south of Bass Harbor and Mount Desert Island and 23 miles east of Vinalhaven Island. 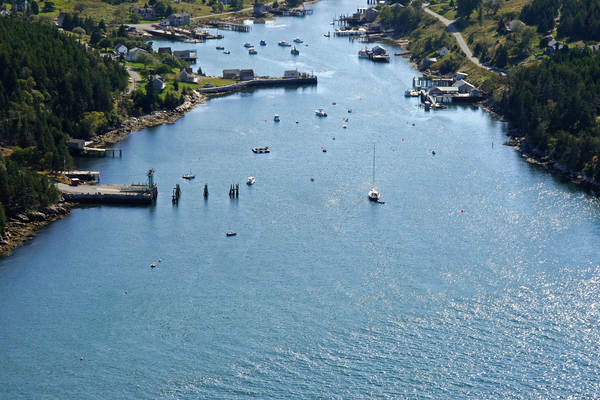 The image above is a view from the south looking north over the Frenchboro Harbor Inlet where it empties into the Atlantic Ocean. 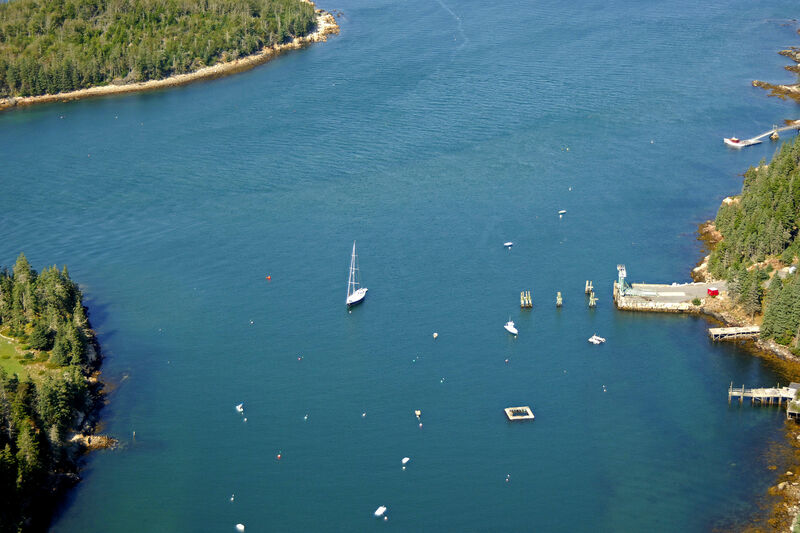 Harbor Island is visible in the upper left-hand corner of the image, while off to the right, the Frenchboro ferry landing can be seen. 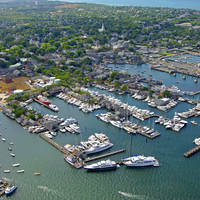 There is only one marina in Frenchboro: Lunt and Lunt. 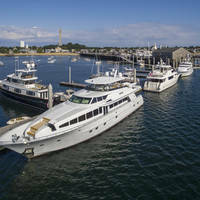 This facility administers the moorings in the harbor and also had gas and diesel fuel available. Though Long Island and Frenchboro do have ferry service, the location is still quite remote and supplies are in short hand. Come well equipped and with a well stocked galley. The best approach to Frenchboro Island is from the northeast. There is also an alternate approach from the southwest (aptly named Southwest Approach). We will discuss both entrances here. If you are coming in from the east, first set a course to intercept red and white Morse (A) buoy LI, which is located at an approximate waypoint of N44 08.338 W68 20.527. Once you have safely navigated to red and white Morse (A) buoy LI, set an approximate course of 242 degrees magnetic. 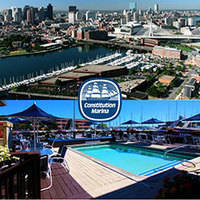 This course will put you directly in line for the entrance to Frenchboro Harbor between Long and Harbor islands. From the southwest, first set a course to intercept red and green nun buoy J, which marks the location of Sunken Ledge south of Johns Island. Red and green buoy J is located at an approximate waypoint of N44 05.746 W68 24.469. From here, set a course of about 059 degrees magnetic for around 2.4 miles until you reach green bell buoy 1 (N44 07.31 W068 22.53) just west of Harbor Island and Frenchboro Harbor. 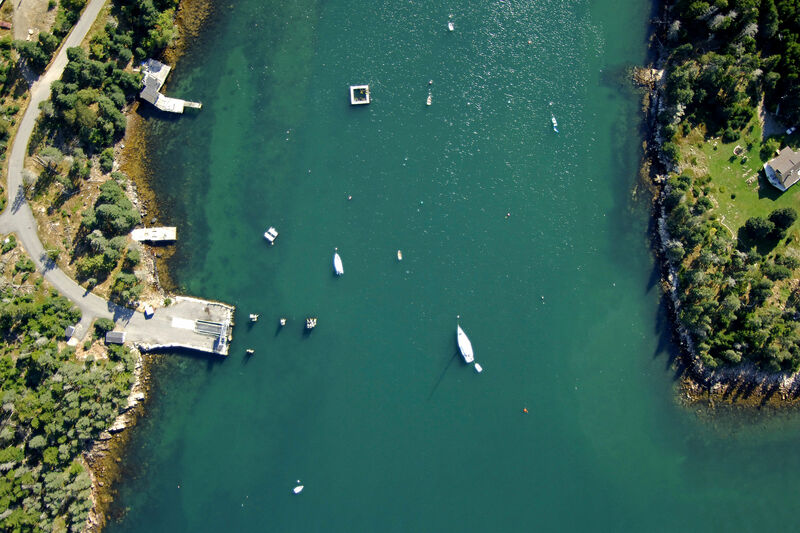 Depths in the harbor range from seven to 11 feet, while approach depths at Harbor Island are around 15 to 35 feet. There are temporary tie ups at Lunt and Lunts fuel dock, but no overnight docking. No reviews yet! Be the first to write a review of Frenchboro Harbor Inlet.